Nothing says summer to me like beach hair and a tan. But gone are the days when I’d put the top down on my Cabrio convertible, round up my best girl friends, and head to Santa Cruz with nothing but our bikinis and a bottle of Hawaiian Tropic tanning oil. That practice stopped sometime after college, when we traded lazy beach days for careers and tanning oil for anti-aging sunscreen. But even though I now spend most days landlocked at a desk and wear SPF year-round, I still want bronze skin and windblown waves come summer. Thankfully, there are plenty of products that’ll recreate that fresh-from-the-beach look, without a day of playing hooky. Here are five of my favorites. 1. Bumble & bumble Surf Spray. It’s no secret that this salt-infused spray is beloved by beauty editors, stylists and anyone who’s after beachy waves. It gives your hair the kind of windswept texture and matte finish that usually only come from a dip in the ocean. 2. Alterna Cleanse Extend Dry Shampoo. Another way to get beach-babe hair is to forgo washing it. This dry shampoo goes on sheer and smells like a vacation-ready mix of mango and coconut. If you’re like me and go through dry shampoos pretty quickly, this is a great one to rotate in for summer. 3. EltaMD UV Daily Broad-Spectrum SPF 40. I recently swapped my Skinceuticals SPF for this EltaMD formula because I wanted a daily sunscreen with a bit more moisture, and this one came recommended by my dermatologist and my friend who’s an aesthetician. Thanks to the addition of hyaluronic acid, it’s hydrating but lightweight and has a tint that borders on bronze, which is just what I need to fake a sun-kissed look. 4. St. Tropez Everyday Gradual Tan for Body. 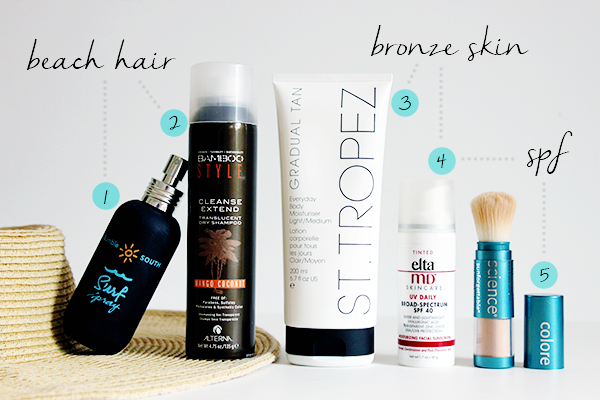 My beauty-writer friend first introduced me to St. Tropez self-tanner, and I was thrilled to learn that they make a gradual version. With my pale skin, there’s less margin for error (read: streaks) with tanners that build a glow slowly. This one dries quickly and is a step up from the drugstore varieties—and much better-smelling, too. 5. Colorescience Sunforgettable SPF 50. For those summer days when I am in the sun, I always pack this SPF powder. Because we all know that we’re supposed to reapply sunscreen throughout the day (right? ), but who wants to mess up their makeup midday with another layer of sunscreen? This mineral version, complete with a handy brush, is perfect for sunscreen touch-ups. St Tropez had the best colour hands down! Love it.